GIC’s PL-100 mini programmable logic controller is a real-time system designed for multiple input and output arrangements. The PL-100 can control a wide variety of devices to support the user’s evolving automation needs. The PL-100 monitors inputs and changes outputs as controlled by the user program, which can include Boolean logic, counting, timing, complex mathematical operations and communication with other intelligent devices. With its free software, compact design, flexible configuration and powerful instruction set, the PL-100 is a perfect solution for controlling a wide variety of applications in the industrial and commercial sectors. • Programming using ladder diagram. • Supports up to 112 I/Os including isolated digital inputs (sourcing and sinking), digital transistorised outputs with short circuit protection, high-speed inputs and outputs (PTO/PWM/S-profile) and analog voltage or current inputs and outputs. • Programming is done through a USB port. • Standard RS-232/RS-485 port with RJ11 for HMI and scada interface. • Stacking using FRC cable up to a maximum of six expansion modules. • Rugged and designed to withstand electromagnetic interference, vibrations, temperature and humidity variations. • Some of the software features include 128 time switches, multiple timers, counters including retentive counters, hour meters and many other function blocks. • An independent scale converter block with various SFBs to convert the corresponding parameters. It supports up to 16 points conversion for various data types. • The modified preset parameters of the SFBs configured in ladder, can be retained by selecting the ‘Retain SFB Set Value’. 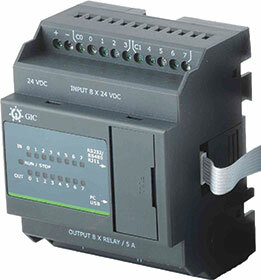 • Complete with LED indication for inputs, outputs, run, stop and error. • User-friendly software for online and offline simulation that supports regular firmware updates. Users can now seamlessly and affordably implement automation in almost any electromechanical process. ADC fills market niche with standardised and highly precise testing systems.